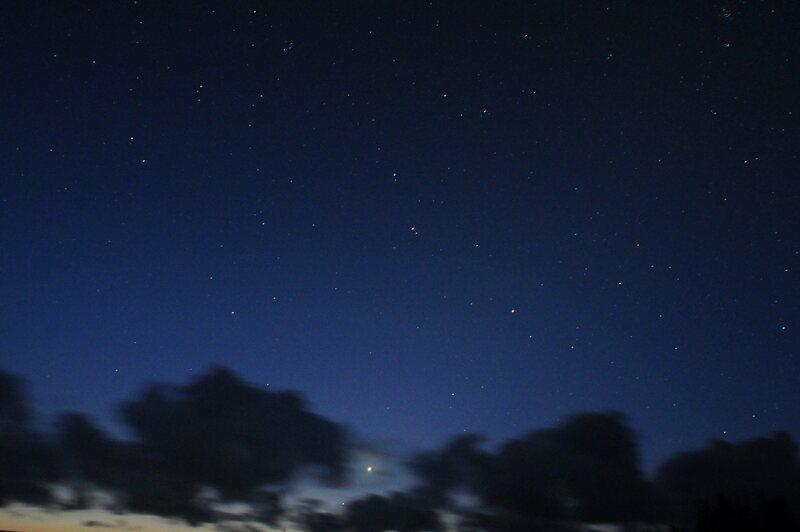 2018 February 5th: Planets in the pre-dawn sky Early February 2018. 2018 February 05 at 06h 54m UT. Looking a little east of south showing from E to W (L to R): Saturn (very close to horizon); Antares; Mars; Jupiter. The Moon and Venus: A short “hole” in the cloud for some 15 minutes. 2017 October 08, 06h 06m UT. 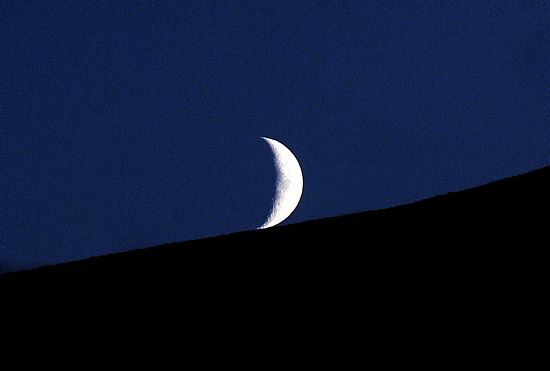 The Moon (phase 2.7%) 37 hours from new moon, and Venus . Nikkor 135mm f/2.8. D300 SLR. A 1/50 sec. exposure ISO 1600. 2017 October 01, 04h 30m UT. A 20 second exposure D300 SLR 24mm f/2.8, ISO 800. (Static camera and therefore showing some image elongation.) Looking NEE/E from Springfield, Rousay. 2017 June 28: The young, crescent Moon perched on the shoulder of Knitchen Hill, Rousay viewed from Springfield, June 28th at 23h 22m BST. 2017 July 25: Lunar Occultation of Mercury. 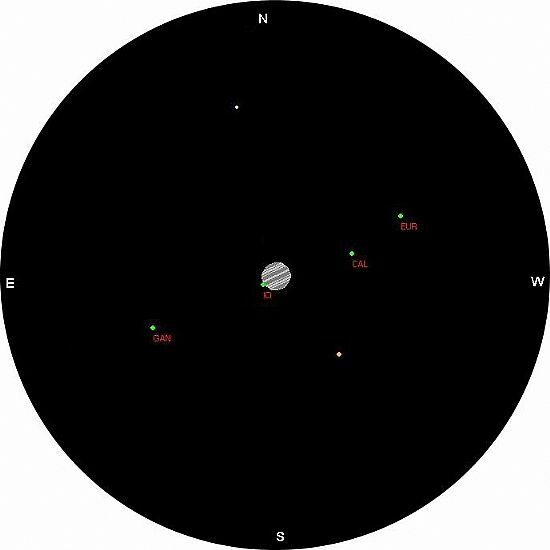 As seen from Orkney, the Moon will occult planet Mercury in the early morning after sunrise. Full details in PDF at Mercury Occultation. There will be a good opportunity to observe planet Mercury in the dawn sky before sunrise from the 22nd September (Mercury rises: 4h 25m UT) to 15th October (Mercury rises: 5h 45m). Mercury increases in brightness a little over six-fold during this period (apparent visual magnitude 1.1 to –1.1), from a similarity with Aldebaran, to almost rivalling Sirius, the brightest star in the entire sky. Mercury, as befits the name, travels fast – some 30 arc-degrees in the period under discussion, passing from constellation Leo into Virgo. 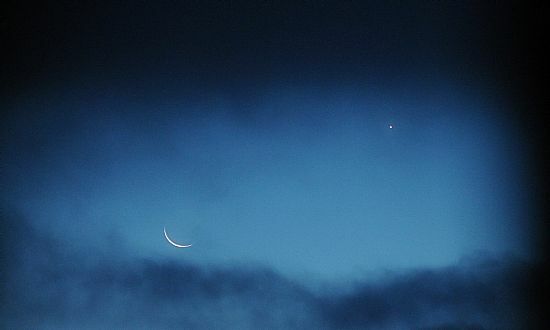 There will be a close conjunction with the crescent Moon on the 29th September and with planet Jupiter on 11th October. At conjunction with the Moon, the separation (centre to centre) will be 1.7°. Moon’s phase 3%. At conjunction with Jupiter the separation (centre to centre) will be 50 arc-minutes with Jupiter below and around twice as bright as Mercury. Mercury and the Moon in an 4° diameter field: September 29 at 05h 00m UT. The path of Jupiter against the stellar background from 2016 March to 2017 March 03 is shown in diagram 2. From this it will be seen that the planet is tracking south on the celestial sphere at a rate indicated already (above). Dia. 1: The night sky looking dues south at one minute before midnight 2016 March 08. 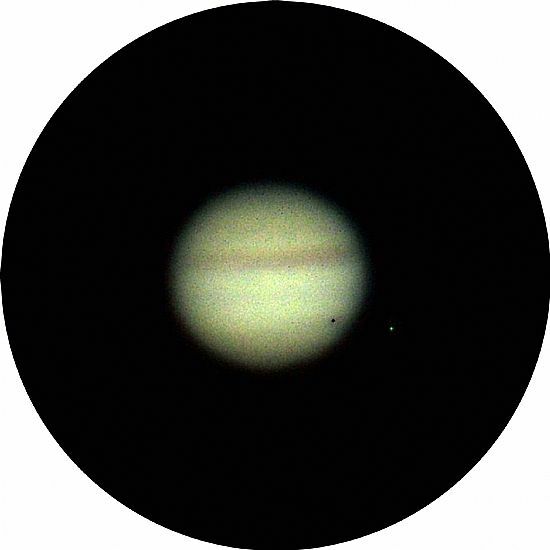 Jupiter, being the largest planet in the solar system, means that it always presents a relatively large image in the telescope, correlating to a consistently bright object to the unaided eye when seen in the night sky. Added to this, the continual movements of the four relatively bright Galilean satellites, it could be said Jupiter is possibly the most interesting planet to study with small telescopes. Dia. 2 The path of Jupiter against the stellar background from 2016 March 08 to 2017 March 03. For more details on satellites go to Satellites of the Solar System. Fig 1. Jupiter imaged 2010 September 11at 00h 30m UT. 120 mm f/7.5 apochromatic refractor. The image shows the near-end of a shadow transit by satellite Europa. 2015 November 02: Plaets Mars, Venus & Jupiter in the pre-dawn sky, Another high atmospheric pressure centred area is giving some opportunity for sky watchers, but as always you "takes your chance"! Long, clear intervals the previous evening and night, with a little auroral glow, enabled us to image Comet Lovejoy in a dark sky before moonrise. See Comet overflow page for details. Fast moving cloud from the SW became a problem overnight into the morning of the 2nd. 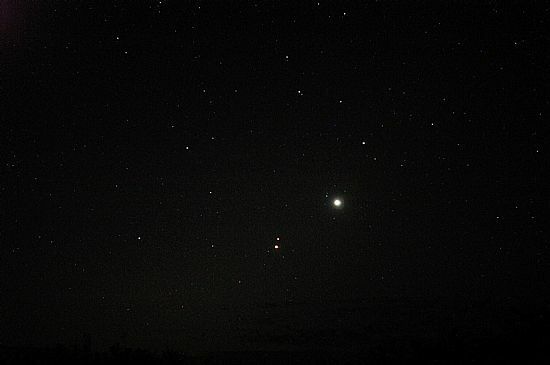 The grouping of planets Mars, Venus and Jupiter became very obvious in a moonlit sky around 04h UT. The image below includes much of constellation Leo with scudding cloud during this 10 second exposure. 2015 October 25: A brief, early morning clearance before sunrise following three days of stormy weather, winds up to force 11, heavy rain and hail. The images below clearly demonstrate the relative movement of the three planets Jupiter, Mars and Venus still in constellation Leo. 2015 October 25 05h 46m UT Looking SEE. 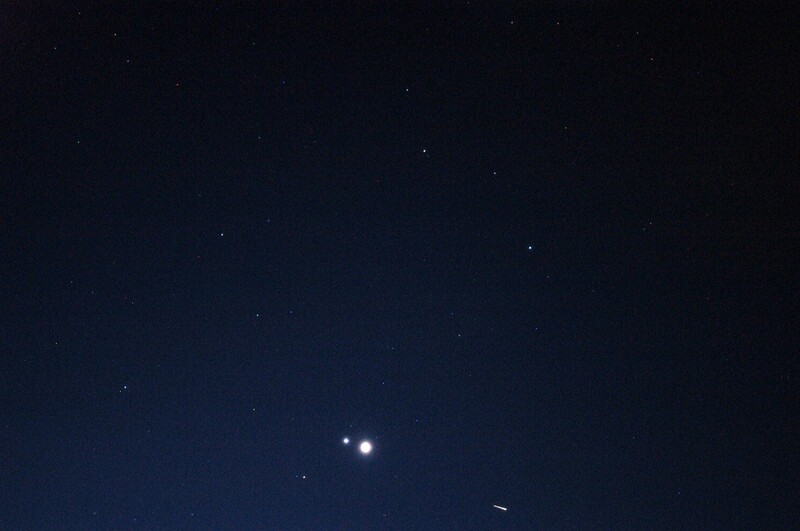 From left to right (E to W): Mars, Jupiter, Venus with Regulus far right, above. Note short trail, low down (R) from artificial Earth satellite. 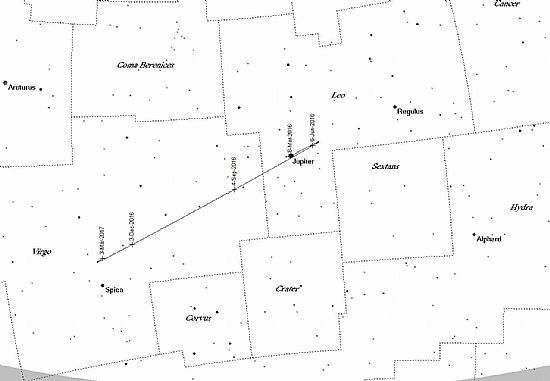 2015 October 25 06h 12m UT Looking SEE. Same configurations as above but with Mercury very low down close to the horizon (above bushes) in constellation Virgo. 2015 October 20: High atmospheric pressure centred over northern Scotland for the past four days producing thick, grey cloud has prevented any hope of observing the Sun let alone a distant star! 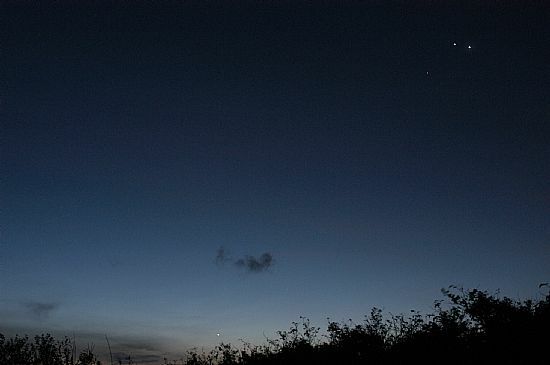 Condition changed slowly overnight of the 19/20th giving a morning before dawn of fast moving cloud and sufficient breaks to enable observations of the four planets Jupiter, Mars, Mercury and Venus. As may be seen from the images below, Mercury appears at some distance from the trio of Jupiter, Mars and Venus. 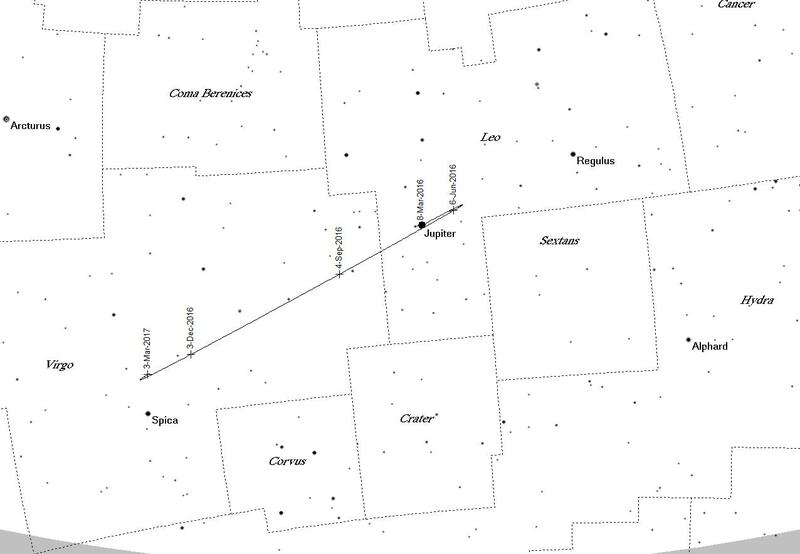 Also low down and to the north is Arcturus appearing not unlike Mercury but about half as bright as the planet. 2015 October 20, 04h 47m UT. 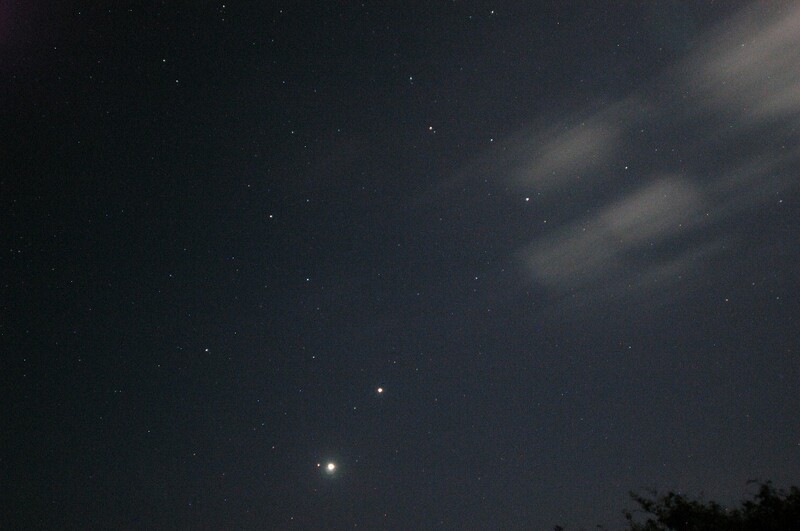 Constellation Leo, with the planets (L to R) Mars, Jupiter and Venus immerging from the cloud. Regulus, in line, far right. 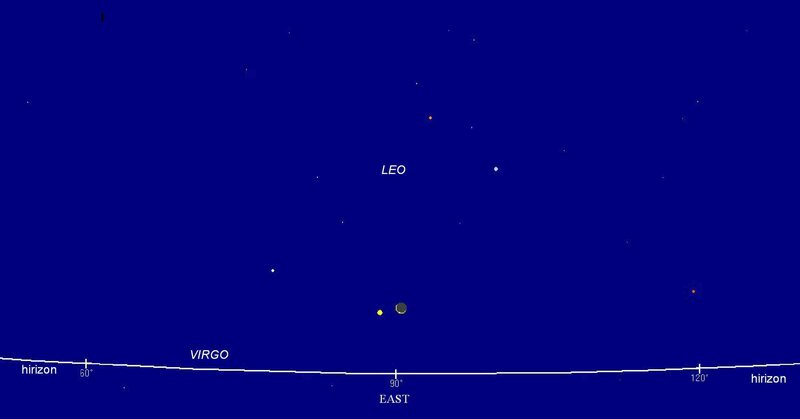 Compare positions of planets relative to one another and to the stars of Leo with those for October 16th below. 2015 October 20, 05h 57m UT. 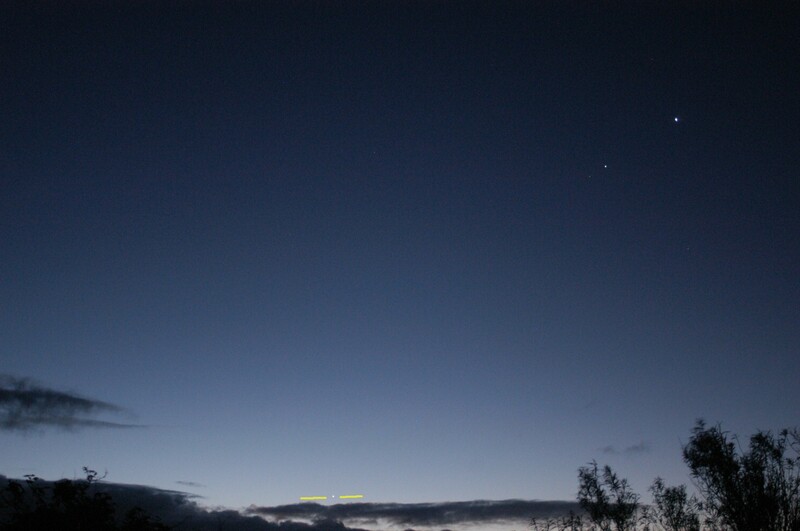 Mercury close to the horizon seen between the two yellow lines (middle-left). Mars a little to the left of Jupiter just visible with Venus right of Jupiter. All imaging Nikkor 28mm f/2.6 and D100 SLR. Early Morning Celestial Spectacular. 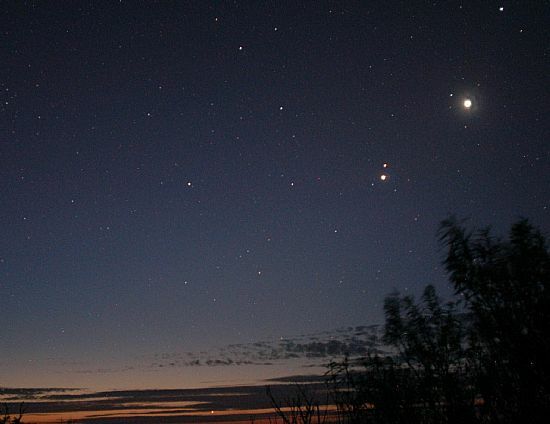 Four of the five naked-eye planets: Jupiter, Mars, Mercury and Venus, together with the fine crescent, Moon, October 8 – 11 and beyond . . . 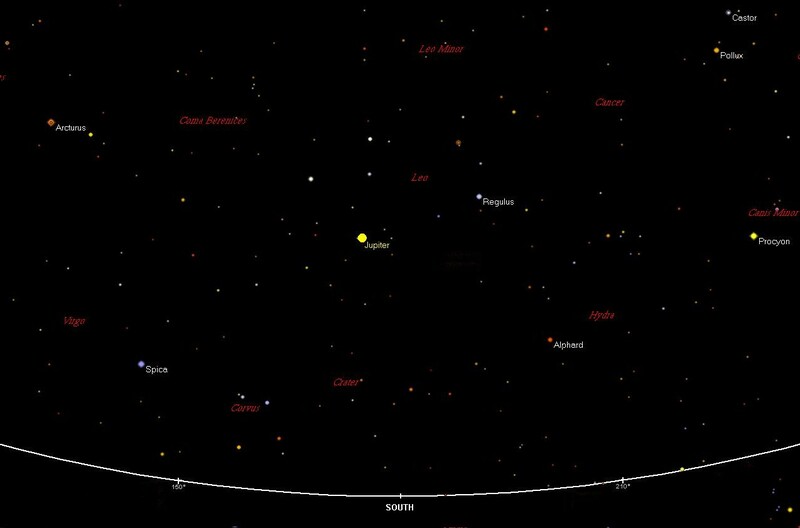 Unfortunately, weather conditions were poor over this early period but there was a clear sky in the early hours of October 16th giving a fine view for the four planets before sunrise that morning. 2015 October 16, Looking SEE at 05 09m UT. 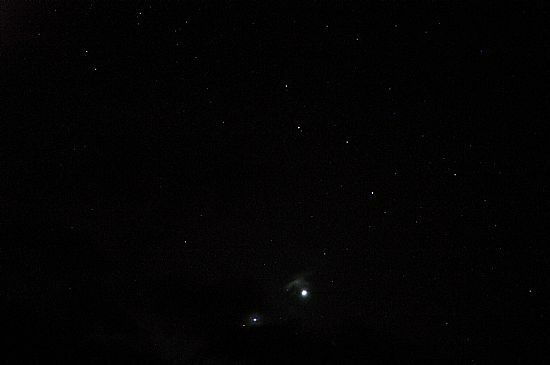 Mercury very low down in the streaky cloud belt low, centre-left; Jupiter with Mars centre right and brilliant Venus above right. 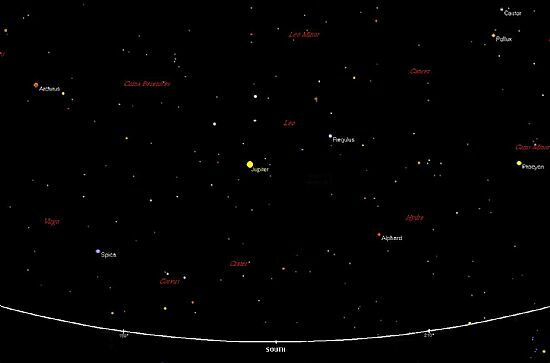 Stars visible are the hind regions of constellation LEO. Mercury rises at 04h 50m UT on October 17th and at 05h 22m UT on the 24th October during which time the planet will have increased in brightness to magnitude –0.9, approximately ten times as bright as Mars but considerably fainter than Jupiter. Venus is close to maximum brilliance at apparent visual magnitude –4.5 which renders it bright enough to cast a shadow best seen on a white, enclosed wall; something I witnessed many times in my late teens in the dark countryside of Essex before the menace of light pollution that is now a feature of our modern world! Jupiter is far from maximum brightness at magnitude –1.7 but is, never the less, very conspicuous. 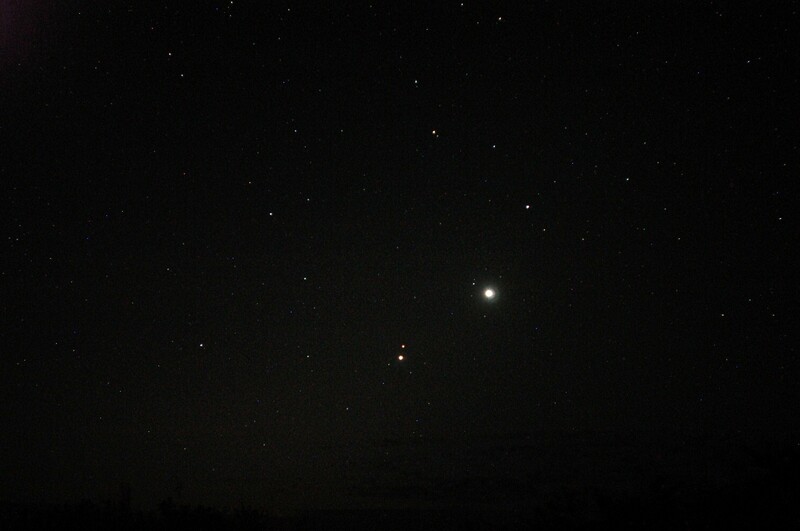 Mars on the other hand is about as faint as it can get as seen from Earth (magnitude 1.8). Were the weather to bless us with clear skies on all four mornings then this would demonstrate well the relative motions of the Solar Systems two “inferior planets” Mercury and Venus and that of the Moon. The position of a fine crescent Moon with Mercury (magnitude 0.3, about 2.5 times as bright as Regulus) close by on the 11th should make for an early morning spectacular. Subsequent days, up to the time of the departure of Mercury from the scene around the 26th October, Venus will close in on Jupiter with Mars, whilst Mercury will have increased in brightness some twofold (magnitude –0.9). Those with a clear horizon may be able to follow events into early November about a week after this, when the slowly brightening Mercury sinks back into the early morning twilight and Venus will be in conjunction with Mars (November 03). 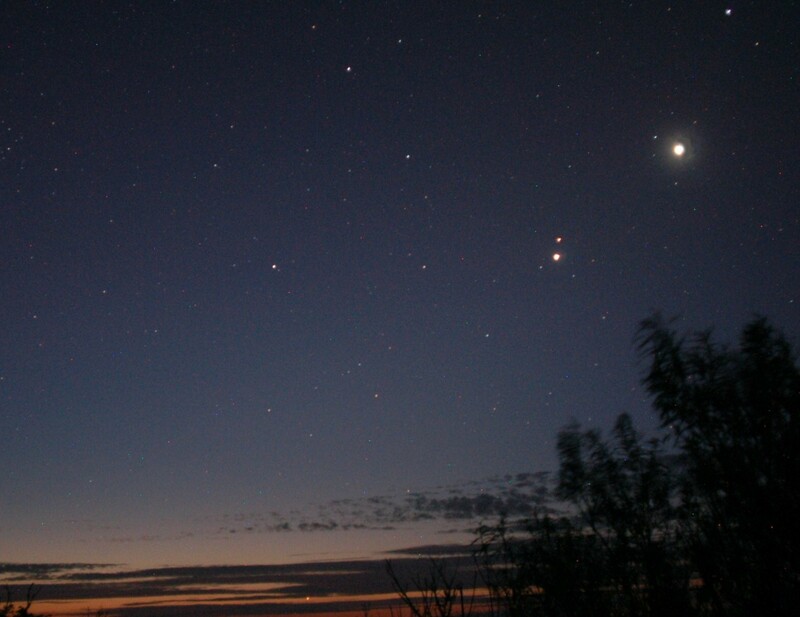 In early April of 2002, there was an even more spectacular, rare event then in the evening sky when all five bright planets and the waxing Moon appeared in our evening skies. This we featured widely at the time. Regulus regulus and Erithacus rubecula.